This year our extra time has allowed us to finally focus on what we love to do the most, which is designing and building custom cabs. I was concerned with our retail store closing, that our cab business would suffer, but the opposite has happened and we have been very busy! 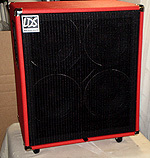 I want to thank all of the musicians that have purchased our cabs and everyone that has helped get the word out thru chat rooms and discussions within the bass community. It has always been, and always will be, my goal to continually improve our product, and offer one on one help to our customers. I want players to have the best possible product for the most reasonable price, and since we do all our work in-house, we can keep these costs affordable. Please take a minute to look at some of our more recently built orders and feel free to e-mail me or call me if you would like to discuss your ideas. 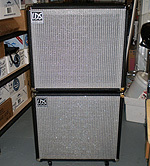 I'm looking forward to designing and building your next cab!